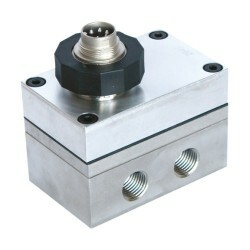 High pressure differential sensor which has high over-pressure with 4-20mA current loop or amplified voltage output in scaleable differential ranges from 3 bar up to 300 bar differential. The PD 39X high over-load differential pressure transducer measures the absolute pressure on the positive and negative side pressure ports and using polynomial compensation techniques to produce two very accurate pressure readings subtracts them both to measure the differential pressure. The PD39 X rangeable differential pressure sensor can withstand very high overpressures due to the very high accuracy pressure reading of each absolute pressure transducer making it possible to select a high line pressure and still maintain a accurate differential pressure reading. The static line pressure can be applied to either pressure connection without causing damage because there is no differential diaphragm. The PD-39X Differential Pressure Transmitter uses two absolute pressure transducers to measure the pressure on the positive and negative side ports. Digital compensation techniques are then employed to provide two highly accurate pressure readings via the built-in microprocessor. The two high precision pressure sensor measurements are subsequently subtracted by the digital electronics and converted into an analogue differential pressure signal output of 4-20mA or 0-10Vdc. The PD39X digital differential pressure sensor can withstand overpressures on either port of 1.5 to 3.3 times the maximum static line pressure without degrading the performance of the sensor. Since there is no differential sensing diaphragm there is no need for mechanical protection stops to protect the sensor from accidental overpressure on one side. This simpler mechanical design provides a very cost effective alternative to more conventional differential pressure transmitters. The PD39X dp cell comes in 5 standard pressure ranges 3 bar, 10 bar, 25 bar, 100 bar and 300 bar differential. Each range can be digitally turned down to the desired differential range. It is recommended not to exceed a 20 to 1 turn down ratio in order to maintain a practical accuracy tolerance. 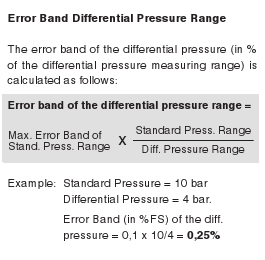 The accuracy of the PD-39X differential pressure transducer is typically 0.5% FS of the standard range which includes linearity, hysteresis, repeatability and thermal errors over a compensated temperature range of -10 to 80 Deg C. Any trade off in accuracy due to pressure range turndown will result in an improvement of overpressure, so both parameters should be considered in order to achieve the optimal differential pressure performance. The PD-39X rangeable differential pressure transmitter is fully programmable via a RS485 half duplex interface and you can configure the RS485 interface to readout the absolute pressures and temperatures of both sensors simultaneously with the analogue differential pressure output. The RS485 communications also provides the ability to adjust zero & span settings at calibration intervals, set up special scaling for the analogue output, adjustment of the low pass filter damping, sample rate & bus addresses, and readout of product information such as range and serial number. The analogue output can also be configured for flow measurements if you require a square root signal output. Differential pressure transducer to operate in a Hydraulic oil line to monitor the pressure either side of a hydraulic cylinder. Measure differential pressure to determine air flow through air lines on locomotive air brake systems. Will the digital comms allow me to read the two pressures as well as the differential pressure? Yes you can use the digital interface to transmit all pressures and temperature including DP, P1, P2, T1 and T2. You can use ModBUS RTU protocol to interrogate each channel or use the optional PC software to display the reading of each channel and plot the trend on a graph. What would be the accuracy of a 0 to 0.25 bar range? 0.1 x 3/0.25 = 1.2%, then 1.2% x 0.25 = 3 mbar, no pressure reading would be more than 3 mbar from the true reading. 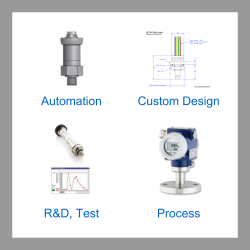 Please select the options you require for the PD39X High Differential Pressure Transmitter in your application and request a quote. Send us your enquiry for PD39X High Differential Pressure Transmitter to get assistance with this product type.